John Polonius: You think the people will thank you for higher gas prizes? King Edvard: My people care about more than just gas prizes. John Polonius: Do they? We'll see about that! Enjoy your honeymoon, your Majesty! Paige and Edvard go on their honeymoon. In an attempt to avoid paparazzi and have some privacy, they secretly change their destination and happen on a plot that the prime minister has to get reelected. A past boyfriend of Paige's shows up (conveniently) and threatens the trust that the couple shares in an attempt to distract and discredit them so the prime ministers plan can go through. Will Paige and Edvard save Batlavia? 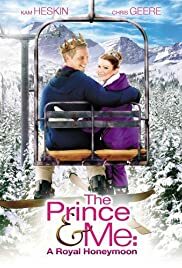 The first Prince and Me was the best of the franchise. While this movie is cute, it is a typical sequel when a franchise tries to keep a story line going. The only time a sequel works, besides a good story line, is using the same actors with the same chemistry. While there is some consistency, it is always disappointing and gives the movie a "B" rated feeling. (especially when it doesn't go to theaters). It is cute and if you liked the second one, you'll like this one. I still prefer the original.